The Top 10 4-Cylinder Cars 2017 is a comprehensive list of cars having sports and family ride tunings. Actually, the 4-Cylinder cars are common among the family riders. Such cars are preferred to run errands. And even these cars have the performing abilities. Mazda has been contributing a lot to the family cars. And the best thing about Mazda is that it adds performing abilities to almost every car. 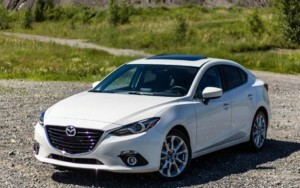 The Mazda3 Grand Touring is one of the living examples of the performing family rides. This car comes with 184 hp 2.5 L Skyactiv engine. Well, it takes only 7.4 seconds to reach the 0 – 62 mph mark. Further, it has a combined fuel mileage of 32 mpg. The Ford Focus is an incredible family ride living today. This hatchback ranks among the best-rated family cars. Though it is just a hatchback, it has enough space for a 5-members family. The Focus ST is the hot-hatch of the Ford Focus series. It comes with a 2.0 L turbocharged engine. And it has 252 hp of power making 270 lb – ft of torque. With this specification, the Focus ST makes the 0 – 62 mph run in 6.3 seconds. And her track best is 150 mph. Further, it delivers 28 mpg as the combined fuel mileage. The Germans are masters of car production. They have produced almost every type of car. Whether it is a family car or the luxury sports car, all is in their fleet. The Audi S3 is yet another reason for so many freeways in Germany. 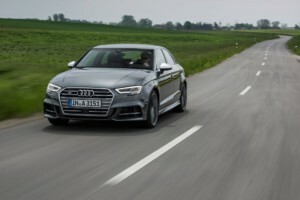 The S3 comes with the standard 2.0 L turbocharged 4-cylinder engine. This engine has 292 hp of power. Well, S3 is capable of making the 0 – 62 mph run in just 4.6 seconds. And its track best is 155 mph. Further, the S3 delivers 25 mpg as the combined fuel mileage. It is a beautifully crafted entry level sports sedan. The Porsche 718 Boxster has everything that the driving enthusiast could demand from a sober sports car. 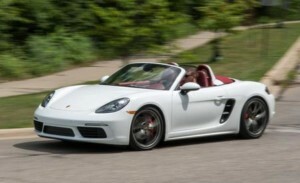 The Boxster is powered by a 2.0 L turbocharged four-cylinder engine. With this spectacular machine, Boxster is able to make the 0 – 62 mph run in 4.7 seconds. And amazingly its combined fuel mileage is 26 mpg. Indeed, the 718 Boxster is a fully-fledged sports car with comfort and performance. But it offers less space to the family riders. 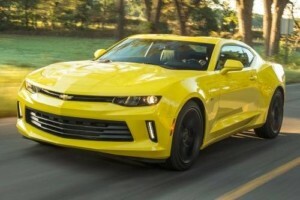 The Chevrolet Camaro has a long history to follow. It is one of the oldest living muscle cars. Well, the Camaro is offered with a number of engines. The base version begins from the 2.0 L inline-4 engine. This engine produces 275 hp of power @ 295 lb – ft of torque. The Camaro took 5.9 seconds to reach the 0 – 62 mph mark during the first drive. But the refreshed Camaro took 5.6 seconds to reach that mark. And its combined fuel mileage is 27 mpg. Boost the eco. Yeah, this is what the Ford Mustang EcoBoost says. This is the lightest powertrain of the whole Ford Mustang family. It is 4-cylinder 2.3 L engine with 310 hp of power delivering 320 lb – ft of torque. 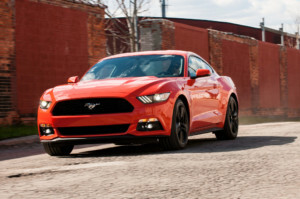 Well, this economical Mustang has an EPA rating of 24 mpg as combined fuel mileage. And she takes no more than 5.8 seconds to accelerate from 0 – 62 mph. Indeed, the Mustang EcoBoost is a pretty decent sports coupe. 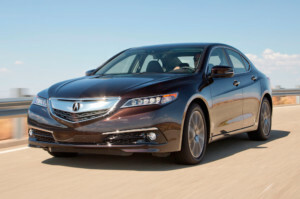 The TLX is yet another screaming Honda badged as Acura. The civilized Civic is more pounding than the tamed Acuras. But this TLX has something to offer to the family riders. The 4-Cylinder TLX has 2.4 L engine. She takes 6.8 seconds to launch from 0 – 62 mph. Further, this FWD TLX has a combined fuel mileage of 29 mpg. On top of that, it has a sweet steering. But it comes with the rusty old Honda infotainment system. The Alfa Romeo is famous for its luxury sports cars. 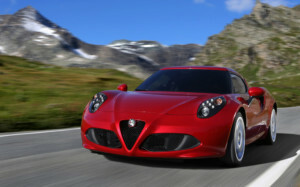 But along with the luxury, the Alfa Romeo has even developed the lightweight performing cars. The 4C is the only example available. Well, this car gets the 4-Cylinder 1.75 L turbocharged engine. It has 237 horses making 258 lb – ft of useful torque. The 4C takes just 4.2 seconds to accelerate from 0 – 62 mph. And has a top speed of 160 mph. Further, it delivers 29 mpg as combined fuel mileage. Besides, its two-seater coupe with no space for cargo. And luxury is totally absent in this lightweight sports car. The Subaru BRZ and the Toyota 86 has almost everything in common. But when it comes to performance, the BRZ leads ahead. 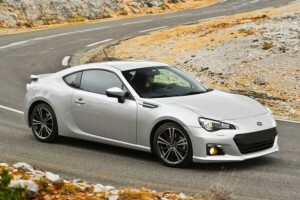 Well, the BRZ has the 2.0 L 4-Cylinder engine. It is actually a boxer engine, instead of the inline cylinders. Well, the maximum power you can get from this coupe is 205 hp using a manual gearbox. But when you opt for the automatic one, you miss out 5 hp of useful power. The BRZ with the manual transmission takes 6.2 seconds to reach the 0 – 62 mph mark. And its combined fuel mileage is 25 mpg. Indeed, it is a sporty coupe. But it lacks some fun. 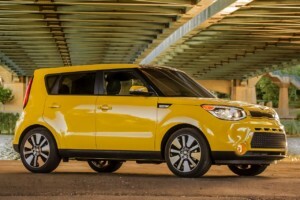 The hatchback shaped Kia Soul SUV has something to offer. It is a blend of performance and family drive. The Soul comes with a range of 4-cylinder engines. The finest is the 2.0 L 201 hp engine with 195 lb – ft of torque. With this engine, the Soul accelerates from 0 to 62 mph in 6.5 seconds. And certainly, it is not a bad result for a family SUV. Further, its combined fuel mileage is 29 mpg, which is better than a number of other cars in this category. So which car are you going to buy from the given list this year? Feel free to share your comments.